Wayne Rich's 'WILD CARD 1' classic noserider. Deep cranberry tint in a gloss & polish finish. Volan glassing of forward swept knee patch and nosecone tail patch. Double 5/16" redwood stringers set 7/8" outside a 1/8" red high-density foam core. Black and white WR logo on top. Single center fin box with fin included. "The Underground Lives" signed Waynoglyphics. 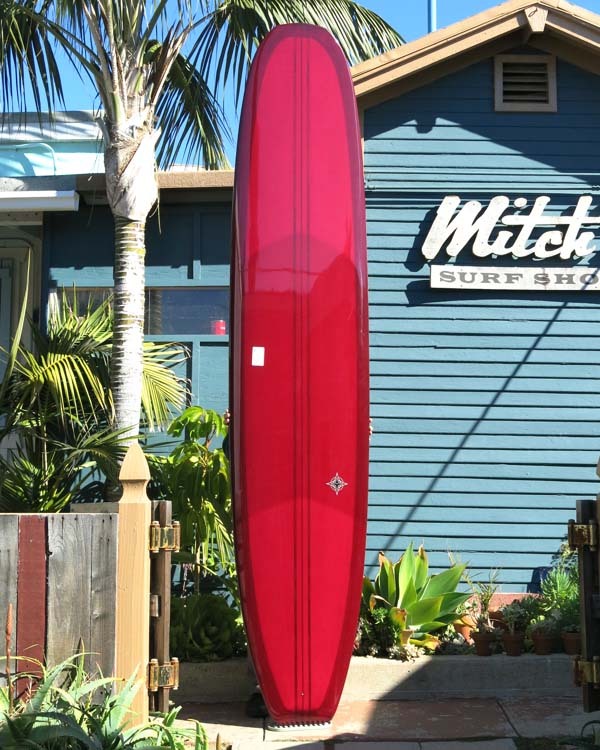 Length: 9' 8" Width: 23 1/2" Thick: 3 3/8"
Nose: 18 7/8" Tail: 17"
The Wayne Rich WILD CARD, ultra-classic California squarenose shape. Huge tail, deep and long concave, shovelnose ideal for wrapping those toes over the edge. Wide point towards the back with very parallel lines. Great, maneuverable board can catch shoulder high and lower waves.